Typically called the most intelligent animal at the farm, Miniature Donkeys are affectionate and often comical animals. They will be under 36 inches in height and can live up to 35 years in captivity. The males are known as ‘jacks’ and the females as ‘jennies’ or ‘jennets’. 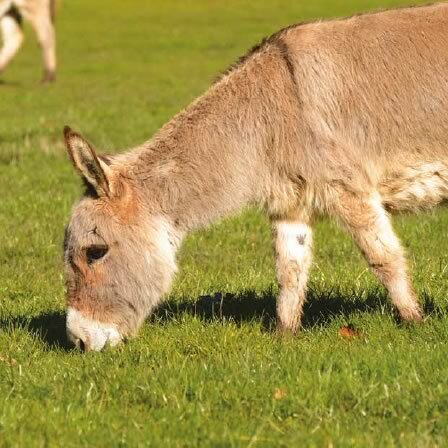 Most donkeys carry the ‘cross’; a darker brown or black dorsal stripe running from the top of the back to the withers and a shoulder stripe. Legend has it that it was a gift from Jesus for carrying him into Jerusalem as a reminder to all of the importance of God’s humblest of creatures!